The Hobbit, The Lord of the Rings, and Tolkien - The One Ring • View topic - Tolkien Beaten By Blyton!!!!!! Millions of people prefer "reality tv" over watchable shows... doesn't make 'em right. Enid Blyton's Famous Five have come top of a poll to discover which books today's adults most enjoyed as children. So the poll is of books read as children and remembered by adults? I cannot believe anyone enjoyed reading Of Mice and Men as a child/teenager. I read it in high school and it was one of the saddest books I've ever read, next to Flowers for Algernon. I mean, I liked reading these books, but to say that I enjoyed them? Nope. Same as Black Beauty. I first read it when I was eight and the book opened the world to a whole new level I never saw before. I actually read and devoured all the Enid Blyton-books when I was younger, and I would have listed them also as one of my favorites back then. Found secondhand copies of The Lord of the Rings when I was 18, and since then they're absolutely my number 1, but not for a child. Perhaps the Hobbit yes, but not LotR. Enid Blyton was my all time favourite as a child. I fondly remember receiving a copy of one of her books each Christmas and birthday growing up. The Famous Five were a must read, but I also loved The Magic Wishing Chair and The Magic Faraway Tree. I always wanted to try Moonface's Honey Snap biscuits (cookies) and wanted to visit those farway lands at the top of the tree. Wonderfully imaginative for young audiences. when I read Harry Potter, I see Enid Blyton's influence all over Rowling, in fact I could have sworn it was written by her, their styles are so similar. Obviously an influence on Rowling as Blyton was a much loved authoress of her time. I don't think these classics made it to America. Shame. But just now it hit me. Blyton was also the author of Noddy! 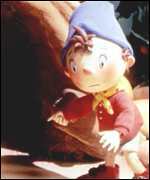 I LOVED Noddy when I was little...So little as a matter of fact that I can't remember what he did, or why I loved him, only that I did. Re: Tolkien Beaten By Blyton!!!!!! TORCNews wrote: Enduring favourite J R R Tolkien makes it on to the list with The Lord of the Rings, the trilogy which began life in 1954, in sixth spot, and The Hobbit, written in 1937, ranking eighth. Umm, I read a whole bunch of Famous 5 Books when I was young. All I can remember is that they spent a lot of time eating mountains of food given to them by friendly farmers/fishermen/innkeepers etc, all washed down with enough Ginger Beer to float a warship. And is Mice and Men and children's book? I suppose it is to Grapes of Wrath what the Hobbit is to LotR.